What's not to love about sunflowers? Besides the fact that they slightly trigger my trypophobia (if you don't know what that is, do not google it, and don't say I didn't warn you! ), these photos were a battle between wanting to be with my favourite flowers (sunflowers) versus my semi-irrational fear (bees). 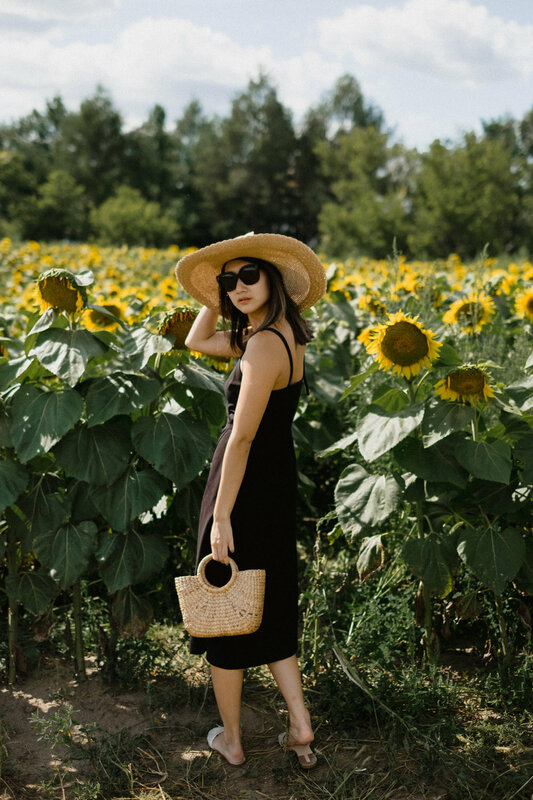 I visited Davis Feed and Farms in Caledon, Ontario a few weekends ago to check out their sunflower fields on a complete whim, which resulted in this impromptu photoshoot. We were actually visiting the boyfriend's parents that day, and because no summer flower field outfit is complete with an unnecessarily large straw hat, I borrowed one from his mom. Also patting myself on the shoulder for having this extremely impractical (but also very cute) mini straw basket with me at the time. Well, these Ontario sunflower fields did not disappoint. I know some other flower farms in Ontario that I've seen pictures of have not been very impressive... (ahem, looking at you lavender farms). The fields stretched endlessly, and we actually didn't even reach the end. Oh, and the best part? At least every other group there is taking pictures with an even more ridiculous (read: over the top) setup than yours (one lady was drumming in the fields whilst getting her photo taken). All in all, definitely not a bad way to end this summer.